This year Trails Utah is launching into one of our biggest trail projects yet! 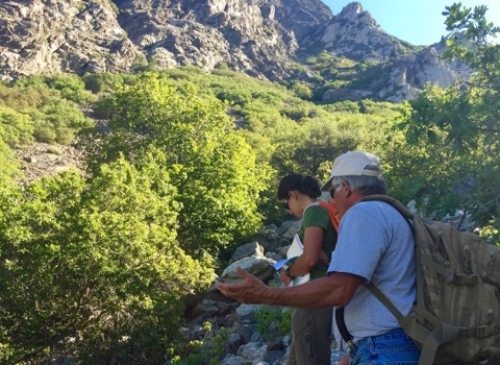 We are excited to be a part of a pioneering partnership between the Salt Lake Climbers Alliance (SLCA), Salt Lake County, and the Salt Lake Ranger District of the Uinta-Wasatch-Cache National Forest to help design and build a needed trail system for climbers and hikers at the mouth of Little Cottonwood Canyon. The dream of a trail system that can serve recreationists and help protect the area has been pursued by the climbing community in Salt Lake for decades. Trails Utah is grateful for the chance to help make that dream a reality. The Grit Mill climbing area, renowned for its massive granite buttresses, draws thousands of climbers from around the country and beyond every year. More than a few notable expedition and big wall climbers honed their skills on the granite faces of Little Cottonwood Canyon, a recreational Mecca for outdoor enthusiasts of all kinds. But because there are no formally constructed and clearly marked trails to get climbers to the base of their routes, this unique natural area has become heavily impacted by user-created trails that scar and erode the hillside. Garbage and graffiti have also taken their toll, but the synergy of public land managers working together with user groups and the non-profit community is going to change all that. While Trails Utah will begin working with professional trail contractors to build the main loop trails through difficult rocky terrain, hand crews from the Access Fund, another non-profit dedicated to preserving climbing access and “conserving the climbing environment” will work with the SLCA to build the spur trails leading up to the base of the most popular climbing areas. They will also build “belay pads,” or platforms, where climbers can more safely belay their partners. Work will begin on the Grit Mill Trail System and Climbing Access Trails this spring and likely continue until completion in 2017. Come out and lend a hand and your support to this innovative trail project during one of several upcoming trail work days and events!